Arginine may help improve blood flow and exercise tolerance in pets with heart disease. 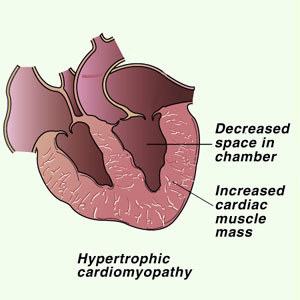 Carnitine deficiency has been linked to heart disease in some dogs (Boxers and possibly Cocker Spaniels) and supplementation may improve heart muscle function. Taurine: Some dogs and cats with cardiomyopathy have low blood levels of taurine, and supplementation through the diet can benefit pets with heart disease. Sodium should be mildly restricted in early heart disease. Potassium deficiency is associated with irregular heart beat and muscle weakness. Magnesium is involved in energy production in heart muscle. It is important to supply the appropriate levels of this essential nutrient. Protein levels need to be high quality and in high enough levels to prevent muscle wasting and exercise intolerance. Energy levels or carbohydrates need to be appropriate to maintain ideal body weight. Omega 3 Fatty Acids like Eicosapentaenoic acid (EPA) and Docasohexaenoic (DMA) improve blood flow to heart muscles and reduce cardiac inflammation and muscle wasting. Veterinarians have available several good therapeutic diets designed to improve life span and quality of life to pets with heart disease. 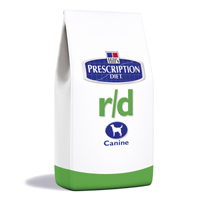 Royal Canin, Hill's and Purina each make an excellent prescription diet designed for heart patients. Hill's H/D Diet for Dogs (Heart Diet) Hill's H/D Diet is formulated to incorporate all the desirable ingredients discussed in the introduction to this page and is ideal for most heart patients. It's available only for dogs and in both canned and dry formulas. Hill's R/D Diet for Cats and Dogs (Reducing Diet) This diet is made to help morbidly obese pets lose weight which is critical for pets with heart disease. It comes in canned and dry versions and we may recommend this diet over a diet specific for heart disease until the weight is reduced. Hill's K/D Diet for Cats and Dogs (Kidney Diet) This diet is made to help patients in various stages of kidney disease ... but kidney disease and heart disease are associated and often occur at the same time. And luckily the diet designed to manage kidney disease is also excellent for patients with heart disease too. 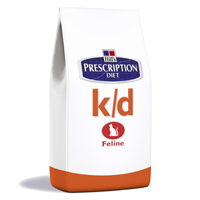 This diet is often my first choice for feline heart patients with or without kidney problems. Omega Fatty Acids: improve blood flow to heart muscles and reduce cardiac inflammation and muscle wasting. Also good for kidney health. Remember that pets often have more than one problem or concern going on at a time. We have several types and flavors for cats and dogs. Duralactin: Effective and gentle relief of inflammation of other problems like arthritis that may be limiting your pet's activity level. Encouraging movement and exercise are important with cardiac patients. AntiOxidants: Helps to minimize tissue damage to cardiac cells as well as to the rest of the cells in the body that get reduced oxygen flow due to a weak heart. We have chewable tablets for dogs. CoEnzymeQ10: This neutriceutical may be helpful in treating heart disease. Also good for gum health. Available at Walmart and most drug stores. 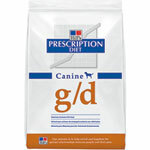 This page is about the special prescription diets and supplements we recommend for cats and dogs with heart disease. Sick Pet Care: What to expect when you bring in a sick pet. The above scene is from Garmisch-Partenkirchen .. a little Bavarian town in the the Southern tip of Germany where I was an ambulance driver and ARMY medic for 2 years shortly after the Viet Nam War. 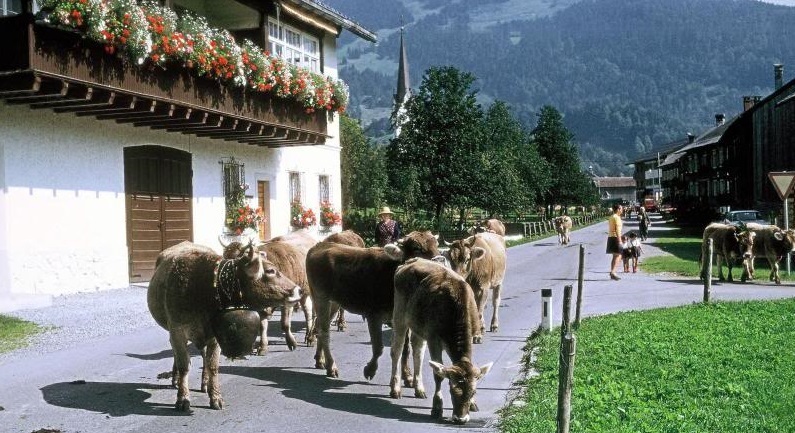 The cows went up to the mountain pastures each morning after milking and came back through town each afternoon to be milked again. This picture doesn't show the chickens that were usually pecking around behind the cows, but it's one reason I enjoy having hens pecking around the clinic. I have fond memories of this beautiful place and of the gentle ringing of the big cow bells.